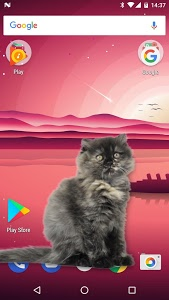 After installing our free application "Cat walks in phone" you will be able to add virtual cat to your phone. 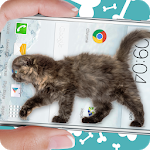 This application will display very realistic animation of small cat walking on the screen of your phone. The simulation of an animal will always be displayed over all started applications. You can play game, browse Internet or watch film and kitten will always be visible. It will always be with you! Our prank application has also many settings, thanks to which you will be able to adjust appearance of mammal to your needs. 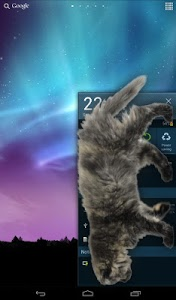 You can decide if you want your cute cat to meow, you can set its size or the edge of the screen it will be walking on. 1. Borrow a telephone from your friend. Tell him that you want to check e.g. cinema program. 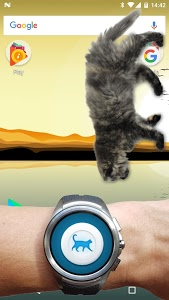 2 Install our cat and set the time after which you want animal to appear, e.g. 10 seconds. 3. Give him the phone back. 4. 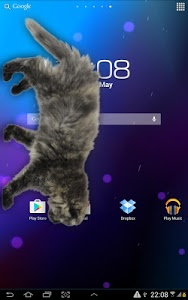 After 10 seconds a beautiful kitten will appear on the screen of your friend's phone. Remember that you can remove animation any time by starting our application again or by pressing remove button on the Android status bar. 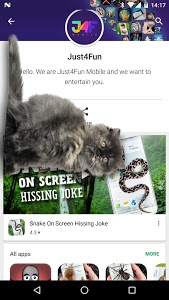 We also advice you to install our best application "Mouse on Screen scary joke". Run both animals in the same time. 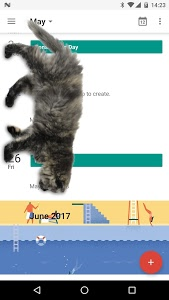 It will look as if a cat was chasing a mouse! Similar to "Cat Walks in Phone Cute Joke"